Inspiration was the best thing served at the Women in Media Breakfast today. The annual event hosted by Foxtel, gives insight into the personal challenges and success stories of some very high achieving people – who happen to be female. 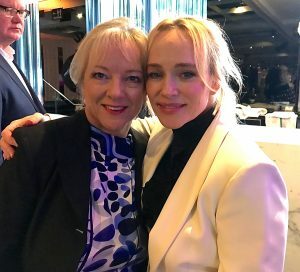 This year the keynote was delivered by award winning Australian actress Susie Porter, who shared a beautifully written and raw account of her own story, which was profoundly moving and inspirational. It was a privilege for everyone to be in the room as she very openly shared her struggles and tale of triumph over adversity, which in large part was due to her tenacity and resilience. Her story is testimony that resilience and reinvention are star qualities and the essential requirements for anyone striving and committed to survival and success. I hope Susie decides to share her speech to a broader audience. It truly was encouraging and spirit lifting. The guest panel of notable women in media that followed Susie’s speech was also responsible for delivering some great pearls of wisdom. ‘Slushy Career’ = a career that is the result of a great many diverse roles and experiences that don’t necessarily fit into a conventional job description. I have brain freeze right now! 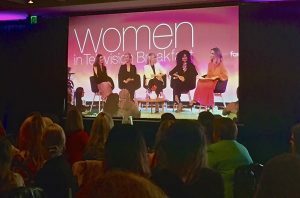 The panelists included journalist, author and presenter Jacinta Tynan, award winning Australian TV and film actress Asher Keddie, Chief Commercial Officer – Foxrel Amanda Laing, Head of Drama for Seven Network Julie McGauran and actress, model and activist Indya Moore. There is a universality in the human experience, writing from the heart with the details of the emotional experience is what brings calibre to storytelling. Clearly the people on the panel think a little deeper than “what’s for breakfast?” on a daily level and for the record, there was a sprinkling of clever men in the room too. Congratulations to Jamie Campbell’s crew from Foxtel and Damien Trewhella’s team from AACTA for presenting a great event.